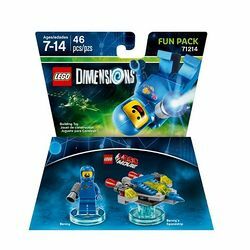 71214 Fun Pack is a Dimensions set released in 2015. The set features a Benny minifigure and a micro version of Benny's Spaceship. This is a description taken from LEGO.com. Please do not modify it. (visit this item's product page) Help Benny from THE LEGO® MOVIE™ save the multiverse… with a SPACESHIP! Let creativity be your guide to a building and gaming adventure—journey through unexpected worlds and team up with unlikely allies on a quest to defeat the evil Lord Vortech. Bring Benny along for the ride as you journey into a crazy mash-up multiverse of your favorite characters. Build and place him on the LEGO® Toy Pad and watch as he’s transported into the game. Then activate his special Hacking, Sonar Smash, Master Build and Target abilities to solve challenges and battle enemies. Use Benny’s Spaceship for even more out-of-this-world fun, and rebuild it into a Lasercraft and The Annihilator for upgraded in-game powers! Includes a buildable Benny minifigure with his megaphone gun and 3-in-1 Spaceship, both with a detachable LEGO® Toy Tag. Rebuild Benny’s 3-in-1 Spaceship into a Lasercraft and The Annihilator for upgraded in-game abilities. Place Benny and his 3-in-1 vehicle on the LEGO® Toy Pad and launch into exciting in-game missions. Activate Benny’s Hacking, Sonar Smash, Master Build and Target abilities to solve puzzles and battle enemies. Visit LEGO.com/dimensions for more information on this exciting LEGO® building and video-gaming experience. Benny’s Spaceship measures over 1” (4cm) high, 2” (7cm) long and 2” (6cm) wide (alternative 3-in-1 vehicle builds vary in size). Facts about "71214 Benny Fun Pack"
This page was last edited on 28 August 2016, at 09:29.